Watches in the Oris Diver's Sixty-Five line are inspired by the Swiss manufacturer's original diving watches from the 1960s. The current models are trendy and use proven movements, all while maintaining affordability. The retro Oris Diver's Sixty-Five diving watch pays homage to a vintage timepiece from 1965. 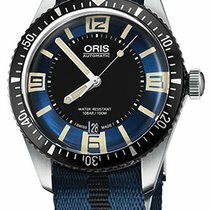 The Swiss manufacturer Oris presented the new edition at Baselworld in 2015 to celebrate the 50th anniversary of the original watch from the 1960s. With this new model, the Hölstein-based manufacturer proved once more that they know what they're doing when it comes to sports and diving watches. The Diver's Sixty-Five is a major success, extremely popular, and can be found at reasonable prices. Since 2015, the watch has had versions in various sizes and with different dial designs and colors. In a move not often seen in diving watches, the "Diver's Sixty-Five Deauville" has a blue-gray dial that brilliantly underscores this timepiece's vintage feel. 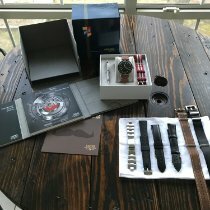 A highlight of this collection is the limited-edition Oris Diver's Sixty-Five Movember, which was developed in cooperation with the Australia-based Movember Foundation. This foundation raises awareness about men's health and supports projects that deal with the research and prevention of male health issues. The 40-mm watch comes with both a brown leather strap and an additional textile NATO strap. The latter has maroon, beige, and brown stripes and the same Movember mustache logo found on the leather band. As in every model of the Diver's Sixty-Five, the Movember Edition is powered by the Sellita 200-1-based Oris caliber 733 with three hands and a date display. The Carl Brashear limited-edition bronze watch is particularly sought after. 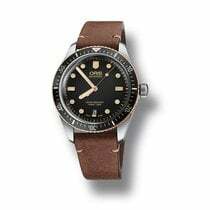 It is also a part of the Oris Diver's retro line and is dedicated to the first African American diver in the US Navy. This timepiece had a limited run of 2,000 pieces, each of which will develop its own unique patina over time. The more recent Carl Brashear Chronograph was also limited to 2,000 pieces and has a stopwatch function. 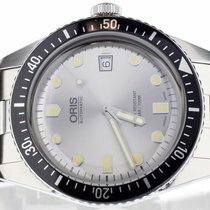 How much does an Oris Diver's Sixty-Five cost? 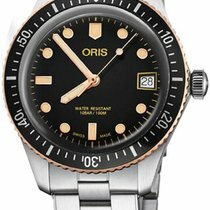 The watches in the Oris Diver's Sixty-Five series are considered affordable luxury diving watches . You can get pre-owned models in very good condition with a textile strap for as little as 1,200 euros. Mint-condition watches with a textile or rubber strap are only slightly more expensive. Set aside around 1,400 euros for the versions with riveted stainless steel bracelets. A never worn Movember Edition costs about 1,700 euros. If you are interested in a limited-edition Carl Brashear bronze watch, be ready to spend around 4,000 euros for the three-hand version or 4,400 euros for one with chronograph functionality. 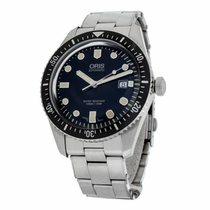 With its vintage look, the Oris Diver's Sixty-Five is quite fashionable since retro watches are currently all the rage. The Tudor Heritage Black Bay and the Longines Legend Diver are also popular diving watches that were inspired by historic models. One of the most important features of the Diver's Sixty-Five is its domed, anti-reflective sapphire glass, reminiscent of the domed plexiglass from days gone by. When beholding this luxury watch for the first time, the dial is sure to catch your attention. On the versions with Arabic numerals and indices, the numerals at 3, 6, 9, and 12 o'clock are surrounded by boxes made of luminous material. As with almost every watch featuring SuperLuminova, the color of the luminous material resembles aged tritium and highlights the watch's vintage look. The hour, minute, and second hands are also coated with SuperLuminova so that they, too, glow in the dark. In addition to the models with painted markers, there are also models with applied dot and bar-shaped markers. The case of the Oris Diver's Sixty-Five is polished on the sides and satin-brushed on top and is either 40 or 42 mm in diameter. The unidirectional bezel used to monitor dive times is the same on every model: black with a continuous minutes scale. There is no protector on the large crown. Both the crown and the case back are screw-down. The case is water resistant up to 100 m (10 bar), meaning you can wear it while swimming, snorkeling, or on shallow dives. If you want to go deeper, take a closer look at the Oris Aquis Date, which is water resistant up to 300 m (30 bar). Or perhaps the ProDiver is what you're after. It meets professional needs and can withstand pressures up to 100 bar (1,000 m). Despite its domed crystal, the Diver's Sixty-Five is only 12.8 mm thick, making it a suitable watch to wear to the office. 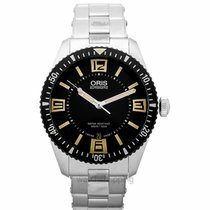 Its stainless steel case back features an engraving of the Oris logo. In terms of bands, you have the choice of textile, leather, stainless steel, or rubber. The latter is also referred to as "Tropic".